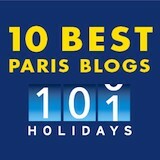 We're proud to have been selected as one of 10 Best Paris Blogs by 101 Holidays! Did you know that Paris is alive with black history, culture, and contemporary life? Most Anglophones, regardless of their ethnic background, don’t! Yet, in a very real sense, the City of Light would not shine as brightly without the contributions of Africans and people of African descent. Entrée to Black Paris™ invites you to take a look at this vibrant and flourishing aspect of Parisian life. I’ll be bringing you information about current happenings, historical notes, interviews with Paris residents, and reviews of the best African / Diaspora restaurants that the city has to offer. For those not familiar with the word entrée, it means “entry,” “entering,” or “entryway.” It also means “first course” when it refers to meals in French. So think of this blog as an introduction – a gateway – to Paris’ black heritage. I encourage those who are visiting Entrée to Black Paris™ not to make the mistake of thinking that it is written only for black people! On the contrary, my goal in creating this blog is to increase awareness of Paris’ black heritage among all people – particularly those who already know and love Paris, and are seeking new avenues of exploration to enrich their cultural appreciation of the city. I bid you a heartfelt welcome to Entrée to Black Paris™, and hope that you learn from and enjoy the information that I post there!